I am an aggressive driver most days. No need to sugarcoat it. But when it rains, I slow down and give myself extra time to get to my destinations. 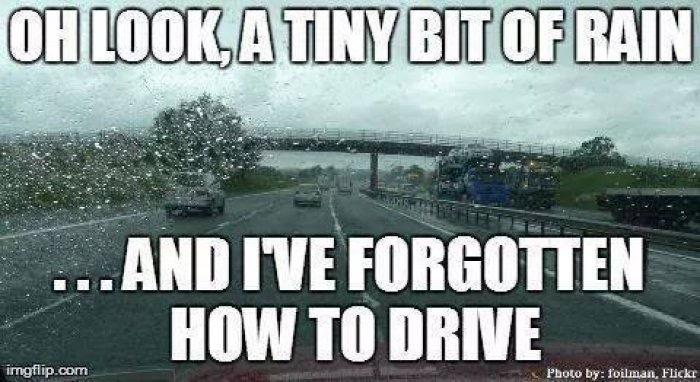 Not because I can’t drive in the rain, but because others can’t. Almost daily on my commute to and from work there is an accident or volume on the roads. Anyone who lives in the Fraser Valley experiences this. It’s truly annoying. Add that we are entering rainy season and people are stupid- means more accidents waiting to happen. So on days like today, I slow down. I take the slow lane (travel lane) and allow others to be stupid and weave in and out. I give a bit more room in front of me just in case. I’m glad I do, because I’ve had close calls of people not checking blind spots or trying to maneuver around some slow driver taking up the fast lane. I’ll get where I’m going in due time. No need to rush. And hey, when it rains- it’s like a free car wash!